"THE DOMINION OF AGONY & TRANQUILITY"
AUTHOR & PRODUCER: NII NAI-TETE. 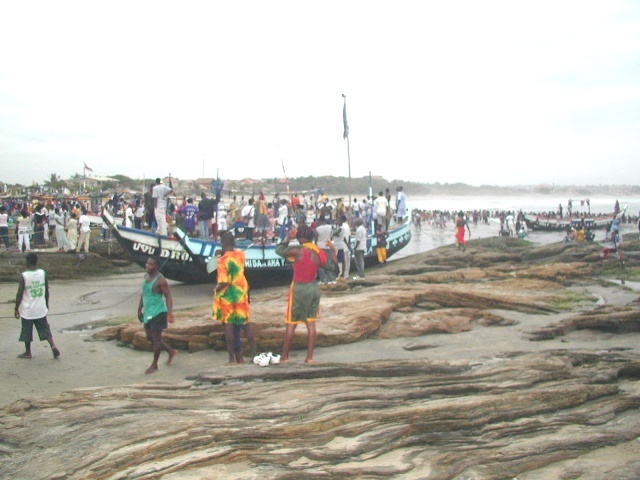 On the Month of May 2002 I visited one of the sub-nations in the country of Ghana, specifically a Ga-Adangbe sub-nation; "Teshie-Asafo". 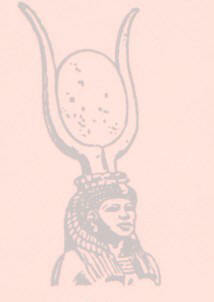 This Ancient sub-nation (Nuubii) Nubians are located on the east of their sister sub-nation "La-Asafo". My mission to Teshie was part of my research on Ancient Nubians' Spiritual Doctrines and Practices. Luckily I succeeded on my mission with authentic materials with the help of "Won-Yoo" (Aawon Amen-Huda) ; A professor and Universal Spiritualist, who is a mentor of the late "Aawon-Kpenkpen" (Won-Yoo); Also a mastered Universal Spiritualist, whose spiritual characteristics I admired, she inspired me with her simplicity which she maintained among every class, yet she never adjusted and always stood firm for her spiritual doctrines of her domain. It was her, Aawon-Kpenkpen whose footsteps I followed to Teshie, to say hello to and to learn more from, that was when I learnt that she had arisen (passed away) at the age of approximately Ninety. I felt spiritually empty for a short time when I heard the news of her death. You can imagine what I felt after a long trip from the U.S.A. and having not seen her for approx. twenty years. Before attending my research in some of their neighborhoods, I was distracted by an Ancient Lava rock which had formed a descending pattern on the ground into the ocean, as once a volcanic lava liquid returning into a huge volcanic rift. In essence I broke off a small amount of the lava rock approx. 2-inches diameter (Basalt like) for further investigations. This Basalt like volcanic rock can be found within a distance of miles and in some cases less than a hundred to two-hundred feet distances between them. Ghana, and West-Africa as a whole, is not known historically as a volcanoic region. However, the Ga-Adangbes have maintain the ancient name of a volcanic rock which is known to them as "Opipo-ter" (volcanic-rock), "Opipo" meaning volcano and "Ter" meaning "stone" in the Ga-Adangbe language. Just like their ancestral Nubians, they were to settle under the sun, to see and witness the sunrise and the sunset which they use to navigate to enable them to succeed in fishing and farming, and to study nature etc. The people of Teshie have great skills of authenticity, they have mastered in farming, fishing, goldsmith, blacksmith, carpentry, construction and are highly inclined in ancient spiritualism coupled with holistic medicine, unique ancient characteristics of legacy from their ancient Nubians. 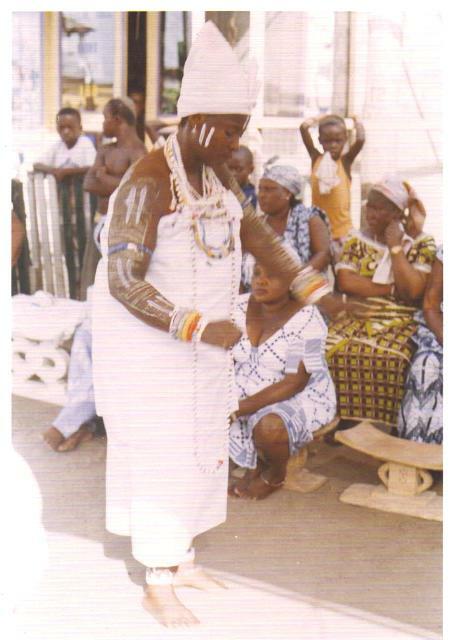 THE DIVINITY OKWEI-NYOMOTSAA OF THSHIE-ASAFO OF THE GA-ADANGBE, DANCING THE SPIRITUAL-ROYAL STEPS OF "KPLE". 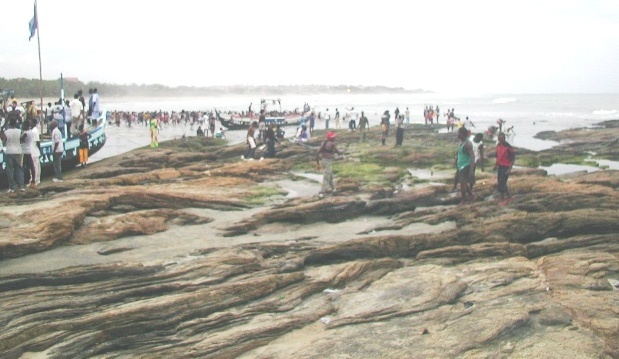 "Aawon-Kpenkpen" and the "Opipo-ter" (Volcanic-larva) have set me up, without my knowledge, on a research which was part of my mission": The dominion of agony and tranquility which nurtured nature on Earth have left us in the cycle of paradoxical. Among the planets, we have come to know Earth as our Mother Nature, while at the same time we have been part of the earth's struggle of evolution since its birth. Part of the areas which were once water are now land and part of the areas which were land are now in water while areas which were once joined are now separated. The size of the Earth is now bigger than before. If the tilting of the Earth was shifted from its 23.5degrees. to 0.degree, it would bring Akhenaten's holy city directly under the sun's equator and the reference point of holy practices of the Ancient Nubians and the holy city location then, will be the present holy location of Islam's Mecca and the city of Jiddah territories, both areas are in the present Saudi Arabia, and in hypothesis with both the Hindus "Banaras" and the Bhudas "Gaya" locations in India. The territory location "Mecca" of the Islam religion in the Saudi-Arabia is what the "Nuubi" (Nubian) "Akhenaten" the "Amenhotep-IV" also inherited as a legacy from his ancestral Nubians before the Islam religion was established. Akhenaten was not the first to identify the Akhetaten area as a holy location. The holy areas were once a strong hold of the Ancient Nubians before Akhenaten and before Noah and the Great Flood. During the period of Noah's ancestors, the structure of the earth was different, only one particular civilized human species of being was known the "Nubii" (Nubians). Their Doctrine was and is to face the eastern sunrise as a symbol of their "Nu" as "Te" the "A-Te" or "Aten / Aton"; which means the spirit of the Supreme Divine. Through the Spiritual Doctrine System of the Ancient Nubians, they were able to flourish unconditionally as many Nations in spiritualism and in knowledge. Evidence of their nations activities and legacies are being ducked everyday, while the rest of their evidence are their buried nations under the sands of the area now called the North Africa desert, the Middle East territories and the Sahara desert. The other live evidence of the Ancient Nubians before and after the Great Flood are the present Nubians; The Black skinned people found anywhere on this Earth. The volcano rifts which lei in the Atlantic ocean and in other oceans of the earth, are evidence of chained volcano eruptions which occurred during Noah's regime. Materials from the chained volcano eruption traveled thousands of miles above the earth and thousands of miles on earth, resulting in an atmospheric combination of an extra force of rainfall, halestone and both cold and hot liquid lava eruption. The force of the water falls from the clouds created a massive soil erosion which buried nations, this dominion occurrence lasted for months. 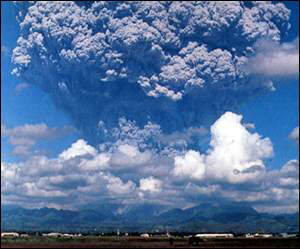 The chained volcano eruption also created land separation and closed other areas land gaps in other land areas. Volcano eruptions always add more earth deposits to the earth, which the last known chained volcano eruption demonstrated, and as a result of which the earth size was increased. This was also followed by the tilting of the earth from its original equator position relocating to the present location of 23.5 degrees latitude north - an area already identified and known by the Ancient Nubians as once being the equator under the sun, the unmistakable location of the Ancient Nubians as part of their spiritual sun worshiping method. The photograph of this volcano eruption is an example, which would have to be multiplied thousands and ten times its eruption force to match the eruption of the volcano rifts which lie beneath the earth's oceans. TO BE CONTINUED; IN VOLUME II: LAVA (BASALT) TEST RESULTS.